Abby Walker is a student in my Create A Profitable Online Store Course and I’m really happy to have her on the show today. Abby runs VivianLou.com where she sells insoles for high heels. What I love about Abby is that she never takes no for an answer and finds opportunities from out of nowhere. Some might call it luck, but I believe that everyone is in charge of their own fate. She’s doing awesome and she’s not even on Amazon yet! Enjoy the interview as there are a lot of details that Abby shares that will motivate you. Steve: You are listening to the My Wife Quit her Job Podcast, the place where I bring on successful bootstrapped business owners and delve deeply into what strategies are working and what strategies are not with their businesses. I’m Steve Chou and today we’re talking to Abby Walker, a student in my “Create a profitable online store,” course who is killing it online. She runs the site vivianlou.com, where she sells insoles to alleviate the pain from wearing high heels. But before we begin I want to give a quick shout out to Privy who is a sponsor of the show. Now I’m super excited to talk about Privy, because I use and rely on Privy to build my email list for both my blog and my online store. Now what does Privy do? Privy is an email list growth platform, and they manage all of my email capture forms, in fact I use Privy hand in hand with my email marketing provider. Now there are a bunch of companies out there that will manage your email capture forms, but I personally like Privy because they specialize in ecommerce stores. Now Privy is easily the most powerful platform that I’ve ever used, and you can trigger sign up forms based on any primer that you desire. So for example let’s say you offer free shipping for orders over $100, well you can tell Privy to flash a popup when the customer has $90 in their shopping cart to urge them to insert one more item. So bottom line Privy allows me to turn visitors into email subscribers, which I then feed to my email provider to close the sale. So head on over to Privy.com/steve, that’s P-R-I-V-Y.com/steve, and try it for free, and if you decide you need the more advanced features, use coupon code MWQHJ for 15% off. Once again that’s privy.com/steve. I also want to give a quick shout out to Klaviyo who is also a sponsor of the show. Now I’m also blessed to have Klaviyo as a sponsor because they are the email marketing platform that I personally use for my ecommerce store, and I actually depend on Klaviyo for over 20% of my revenues. Now you’re probably wondering why Klaviyo and not another email marketing provider. Klaviyo is the only email platform out there that is specifically built for ecommerce stores, and here is why it is so powerful. Klaviyo can track every single customer who has shopped in your store and exactly what they bought which makes it extremely powerful. So let’s say I want to send an email out to everyone who purchased a red handkerchief in the last week, done. Let’s say I want to set up a special autoresponder sequence to my customers depending on what they purchased, piece of cake, and there’s full revenue tracking on every single email. Now Klaviyo is the most powerful email platform that I’ve ever used and you can try them for free at mywifequitherjob.com/Klaviyo. Once again that’s mywifequitherjob.com/Klaviyo and that’s spelled K-L-A-V-I-Y-O. Now on to the show. Steve: Welcome to the My Wife Quit Her Job Podcast, today I’m really happy to have Abby Walker on the show. Now Abby is actually a student in my “Create a profitable online store” course. She joined over a year ago and she’s been doing amazing with her business Vivianlou.com. Vivian Lou sells special insoles that allow you to wear high heels four times longer without any pain, which is actually a major pain point that a lot of women have. Recently she was featured in Oprah magazine and on the View and in October alone she closed with six figures in sales. Anyway today we’re going to dig deep and find out how Abby came up with the design and how she managed to get the word out about her insoles. And with that welcome to the show Abby, how are you doing today? Abby: Very good, thank you so much for having me on. Steve: So Abby I was just curious, I mean both the name of your store and your product are a little bit random, so how did you get leads for your online store and the name? Abby: Sure so I’ll just go back from the beginning, because I honestly stumbled across this product as I was kind of just a random question I asked. So my story starts actually in 2001, so I was fresh out of college, working in down town Chicago and I fell in love with high heels. I was struggling to find a niche in the workplace, and I worked with these women who had beautiful hair and beautiful jewelry and beautiful clothes. I was like how do I find my niche in the workplace and still move across a pair of high heels that I absolutely loved and forever kind of changed my course. I was in the corporate world, corporate communications world forever, but had really always loved high heels and wearing high heels. So in 2012 I decided to start a blog, and this blog was actually the platform for me starting my online business but in a roundabout kind of way. So I launched this blog called Mama’s Shoes and I worked on that honestly off and on for about two years. In January 2014 I wrote a blog post about foot sprays that were designed to alleviate pain and reduce inflammation for women who wear high heels. And I felt these products were phenomenal in concept, but at the time I worked for a company that manufactured holistic supplements, and so I was really attuned to the ingredients that were put into beauty products and over the counter products. Some of these products had Lidocaine which is a numbing agent that then [inaudible 00:05:46]. Abby: And so in my mind I was like, well great concept but if you wear high heels you really probably shouldn’t numb your feet, it’s not a very good idea. So I had this great idea in January of 2014 that I was like I’m going to create my own foot spray. And I knew nothing about manufacturing, I knew nothing about formulations, I knew nothing about ingredients, but I pretty much had the courage and the curiosity to hire some folks who could help me formulate the spray. So I hired a clinical [inaudible 00:06:21] and a naturopathic doctor to help me formulate this foot spray, and it was a phenomenal, phenomenal product. We could manufacture it on a small scale, but we couldn’t replicate the effects of the product in a large scale. So I was really frustrated, kind of broken hearted, because this business concept that I had or this product concept wasn’t taking off. But I continued to do market research as it relates to women in high heel pain, and in April 2014 I stumbled across this forum where two women were talking about this amazing insole called Insolia. I was like why have I never heard of this, I wear high heels every day, I shop for high heels, I write a blog, why have I never heard of this product? And so I called up the CEO of the product and said, why have I never heard of this product? Long story short he sent me some samples, I tested them out, I fell in love with this product, and I offered my services to help him market this product to women. My initial proposal was like, hey I’ll take a cut of an increase in sales, and long story short their company had pivoted out of the direct to market, or direct to consumer market. They are a company that’s really based on creating – being OM, so design insoles that are manufactured into shoes. So they really weren’t looking to grow their direct to consumer market. And so long story short after a couple of conversations, I ended up becoming the exclusive distributor of the product in the United States and Canada. Abby: I know so it all happened because I picked up the phone and asked why have I never heard of this? Steve: I think you skipped a bunch of steps here, so why was he willing to take a chance on you and become the sole distributor? Abby: Honestly I have no idea, honestly I don’t know. The two gentlemen that I work with are absolutely phenomenal, they are wonderful people who are probably two of my biggest cheer leaders, and honestly I think because they are so focused on growing the Om side of things that they were willing to take a chance on me on the direct to consumer business. They weren’t doing that much of business, so it wasn’t like they were – there was a steady pace of sales, but it wasn’t significant enough to look for someone who had a tremendous background. I think they were just really curious about how I could grow given that I am passionate about the product and I wear high heels every day. They were men to be quite honest trying to market a product to females, and so I suspect that where they were like, oh this woman came to us and said she was interested, and let’s give it a shot and see where it goes. Steve: So they allow you to put your own brand on the product as well? Abby: Correct they were unbranded, so it’s all branded under Vivian Lou, yeah so it’s my brand, my company and they act as pretty much my contract manufacturers and I have like as I said an exclusive arrangement with them for Canada and United States. So just a phenomenal opportunity, but I didn’t know the first thing about online sales or building a store or what I was doing, so I spent the summer of 2014 really drinking from the fire hose. I had to look up legal entities and minimum quantities and insurance and trade mark and packaging and all of that kind of stuff. It was a crazy summer to say the least. Steve: So why the name Vivian Lou as opposed to Abby Walker? Abby: When I started the company, I was really looking to give the company a personality and I was reading all these articles about naming conventions and how you should have a single word and it should have an X in it and it should really capture people’s attention, and then that really sat well with me. And so one day I actually sat down and created a list of attributes of the women I would like to serve with my company. So it was she stands tall and shines bright, she can accept the compliment with a simple thank you, she is feminine but can run with the boys, it’s just that all of these like list of attributes, and one night after dinner I was actually sitting down with my husband reading all these attributes and he was like I know someone who that describes exactly even though she may not be your target market. I’m like you’re right; it was our three year old daughter. Abby: She doesn’t wear high heels, but she embodied all of these attributes that I was describing, and so I decided to name the company after her. Steve: Okay, that’s a big story actually. Abby: Yeah so it’s funny because we see all this Vivian Lou everywhere and my son is like when are you going to come up with a company named after me. I’m like next company honey, next one, so yeah and one of the most things that I take most pride in is 2% of every single one of our sales goes to organizations that help women revitalize their confidence and reclaim their independence. So we support Dress for Success in the Twin Cities and the Women’s Bean Project in Denver. Steve: Okay, so just curious with this manufacturer, are there minimums or like in the beginning were there any minimums that you had to purchase or did they just give you a bunch of products and say, hey just try to sell these. Steve: But even the order of 1000 like did you know that they were going to sell ahead of time, like did you validate it before you bought 1000? Abby: No and it’s so funny because at the time it was just kind of a side business, so I worked full time, my husband worked full time or works full time still, and he’s like this is a really hair brained idea like you don’t have any background in this, you don’t even know – so he agreed, it’s like I will give you $7500 and then that’s it, like you can do with that what you need to do to build a website, order product, get your boxes, find a fulfillment center. So one of the things that I first did was I knew that if I were fulfilling orders out of my basement or garage, it wouldn’t go anywhere. I needed to partner with a fulfillment center right away, so that’s one thing that I did that I think helped set me up for the success where I am today, because I wasn’t scrambling to fill orders, it was all done through a fulfillment center. Steve: Which one did you end up going with and how did you find them? Abby: I went with a fulfillment center in Minneapolis, at the time I was in Minneapolis. It’s called King Solutions and they were great, they were honestly phenomenal, I actually love that warehouse. And I just picked up the phone and called a bunch of fulfillment centers and asked if they could fulfill orders out of Shopify. So my store is built on a Shopify platform and then you won’t have to do like all of this data transfer. I wanted them to have an API on app that would sync into Shopify so they could pull orders out and then upload tracking information for shipping, and I was really small like I only had 1000 products offer, so none of these big warehouses were even willing to talk to me. So I was just kind of picking up the phone and doing a lot of Google searches and asking if they would be interested in taking on the small, but potentially many. King Solutions actually took me on and phenomenal. They were a great partner and I’ve sent to move the company to Wisconsin. Steve: Just curious like how much does it cost for them to fulfill something like a typical order? Abby: Then there is a pick and pack, so if an order comes in and if there are four units on that order, then you get charged per pick, and so that would be your pick and then obviously the shipping cost involved. Steve: Okay so overall it’s a very small percentage of your cost? Steve: Okay, you know what’s hilarious, I didn’t know about your back story about your suppliers, so I had a bunch of questions like how you found your contract manufacturers, but it sounds like everything was just kind of serendipitous, right? Steve: They’re very reliable from a supplier stand point as well, right? Abby: Absolutely, I mean it is like a lot – so I’ve told my story to several people and a lot of them are like they are just like divine interventions, like how this happened, why you picked up the phone, why they are willing — and it is, it’s all serendipitous like how this all came to be. Steve: And in terms of your website did you design that yourself or did you contract? Abby: So my first website, so I designed – I hired a gentleman who I knew to design my logo, but then I designed the original packaging, this brown box that it came in, I designed my own Shopify website and it was embarrassing. Steve: I didn’t think it was bad actually because it had the message, like I always look for the message as opposed to the esthetics. Abby: Right like write up tab. Steve: Spice it up a little. Abby: I’ve actually raised the price twice. Steve: Yeah I was going to talk about that actually, I think they are too inexpensive. I just want to take a moment to thank ReferralCandy for being a sponsor of the show. Now for any ecommerce store, word of mouth is huge, and when a customer is supper happy with their purchase, they’ll tell all of their friends. Now what if there was a way to amplify word of mouth about your company, what if there was a way to reward referrals for your business. This is where ReferralCandy shines, with just a couple of clicks of the mouse; you can add a referral program to your ecommerce store and reward your customers for telling their friends about your shop. And the best part is that ReferralCandy is a set it and forget it service, requires no technical setup and they are giving My Wife Quit Her Job listeners 50 bucks to try them out if you go to promo.referralcandy.com/steve, once again that’s promo.referralcandy.com/steve to get a $50 credit to try the service. Now back to the show. Abby: Oh I love you, I love you. So it is so funny, okay when I first took on this product, the manufacturer had perimeters for me and I didn’t know enough of it at the time to kind of push back, but I knew that I was selling two for 19.95 and I knew that that really was positioning this product in line with the doctor soles or [inaudible 00:19:18] the doctor soles. This product is so far beyond the doctor soles product or any other insole in the market place. The science that has gone behind it, the way it’s designed, the way it’s fitting your shoe, it’s not one size fits all. It comes in four different sizes; I mean it is so scientifically based in why it works and how it works that I knew it needed to be positioned in elevated space. But I took their guidance, and then in the summer of – oh man, I don’t know if it was the summer, but in Minneapolis I went to a free seminar talking about seven steps to increase your sales. The woman who was putting on the seminar [inaudible 00:20:04] who is phenomenal by the way, she recommended that I double my price. She was, you’re not positioned well to sell in the market place, like you should be selling one for 19.95, and I was like I don’t know if I can do this. She’s like I challenge you to do that, do it this weekend, like don’t sit on it, just do it. So I did it and I got two hate mails from customers, they weren’t taken aback, I think they see the value in this product, and I also offered I said for the next six months you can get it at two for 19.95 versus the one for 19.95. So that was where I ended up, but then when I re-launched the product and the branding in August of this year, I actually took it to $29 per pair, and then offered bundles, so women can get at much significant discounts if they add bundles, a bundled pair to their offer. Steve: Yeah even that I think you can even go higher, because it’s all like such a huge need that everyone is looking for. Steve: I didn’t notice all those doctors, like were you involved in that in getting the doctor studies and all that’s tuff or was that…? Abby: No that had all been done before I had — yes. So I literally was handed a business, like a really viable business. Steve: It’s really guys, anyone who is listening should just head over to viavianlou.com, it’s a really good sales page, like as soon as you land on there, you know what the value proposition is, and so Abby just did a really good job on the site. So let’s talk about the first sale, how did you get your first sale? Abby: Yeah like a list of emails from women who had purchased previously direct from them and all had expressed an interest. So I started there just reaching out, sending out notes to women saying, “Hello, you may have purchased this before from Insolia, but now I’m the authorized distributor in the United States and Canada. I would like to offer it to you at a discount, can I get you on my email list yadi yadi yadi yada.” That’s really how it started generating sales. Then it was just kind of word of mouth. I was doing some Google advertising and some really minimal advertising on Facebook myself, but that wasn’t generating much traffic. So in early 2015 I was doing five sales a day, and so it was still kind of a hobby, and it was frustrating because I knew the potential for this product was huge and I was really struggling with how to get it off the ground. I kept it that way throughout much of 2015, and then my brother in law who works for Kohl’s department store, he works in their corporate headquarters, he had actually gone to a conference in New York City about the future of retail. Her retail store operates like a magazine where every month or so it’s torn down and it comes up with a new theme. I had signed up for her newsletter because I thought that concept was brilliant and I was like maybe one day my product would fit into one of her stories. Two weeks later I got an email saying that she was hosting a pitch night, and these pitch nights typically are designed for artisans and local business owners in New York City, but because I was on her mailing list, I was like why not me. So I actually applied to attend a pitch night in September and I was actually one of 34 folks who were accepted to come pitch. So September 16 last year I flew to new York City and pitched my product to Rachel Shechtman. Well she also had there Middy Grossman who is the CEO of HSN. So I was scared out of my mind but I pitched my product, and half way I had 3 minutes to pitch and half way through the pitch Middy Grossman took off her Christian Louboutins and was like put them in, if they say what you say they can do, put them in my shoe. I was like you realize these are permanent placement insoles, like I can’t take them out once I put them in, and she goes let’s do this. And she stood up, and she’s like where have these been all my life. And you have three minutes and no one commits to anything, and Rachel is yelling out I’d like to have these in our home for the holiday Story, your head is just spinning. So I left that night not knowing anything, I was great, Middy loved them, Rachel clearly thought they were neat, but there was no commitment. So literally I said like a silent wish, every morning I was like please HSN call, please HSN call and sure enough a week later I get a phone call from HSN saying that Middy Grossman had dropped off the product, and wanted to test it on a show. Steve: This is crazy, okay. Abby: It is, I mean it’s just crazy. And so I was fast tracked through HSN like QA and legal process because they were trying to get – when I originally talked to HSN, they were hoping to get the product done during the Easter time frame which is a big push for them, but I got a call in November saying that they were trying to get it on I thought as a product wrap up bought like product introduction on January 4th. So I had to re-kit the product, so they were selling them as a two pack so we had to buy suffocation bags and HSN only UPCs and have my warehouse get all this new product. So we were able to get that done and ship it off to HSN in December in time for this January 4th show. And ironically we had gone to New York City over the holidays and I had run in Rachel Shechtman, because we went to see the product in the store, and she goes, “Oh well you must be going on air on January 4th.” And I was like, no it’s just a product wrap up, she goes, “That’s odd,” she’s like typically you’ll be going on air. And so I left the store that day, and I was like oh no, oh no. I’m like but I’m not going to think about it because I haven’t been contacted, and sure enough I went back to my in law’s house that night and I got an email from Rachel saying, “You haven’t filled out your HSN profile like on air personality profile. I was like, oh no, so literally it was a week I didn’t eat or sleep or do anything for a week. I was so nervous but I was on air on January 4th. Steve: Oh you actually went on the show? Steve: On HSN, what are the terms in terms of like financial? Abby: Sure so it varies. They actually place POs [ph] with me, so they place POs and then there are different ways to fulfill that product, so you can either drop ship directly from your warehouse or you can send it to one of their central warehouses and they can handle all the fulfillment, the customer service and all of that kind of stuff. They were getting it at a price point that it didn’t make sense for me to handle all the fulfillment and the customer service. Through our negotiations, I just send them all the products and they handle all of the fulfillment and customer service side of things. Steve: Are you willing to reveal like how much they take of the cake? Abby: Sure, they take upwards of 60%. Steve: Okay, it’s not horrible, okay. Abby: It’s not horrible but they were selling two for one, so it was on top of an already 50%. Steve: Oh I see, got it. Abby: Yeah but the way I looked at it is I was making money, it wasn’t a lot but I was making money per unit sold, and the way I looked at it I was making money to advertise, because it was a great advertising opportunity. So even though it wasn’t a great financial position for me, how can you say no to an opportunity like that? Steve: Do you get the [inaudible 00:29:03] as well like email address? Abby: No, no, no, no, so they keep all that stuff, so they keep that really close to their vest, they don’t reveal that kind of stuff. So I went back on, on March 7th or 17th and sold out again, I went back on April 4th and sold out again. Steve: Can we get an idea of like how many units we’re talking about here? Abby: Sure so it was between – they varied, but it was like 1200 units or 1200 two packs. Steve: Okay in like a span of like an hour or something like that? Steve: Ten minutes, good lord. Abby: Yeah, so I went back in April of this year, I’m like Bill my husband, I was like if I can prove that market and this product – there is a market in HSN which is such kind of a microcosm of — it’s such like a unique viewer audience. I’m like if it can sell out in ten minutes three times consecutively for this audience, there has to be an opportunity for me to blow this up across all of United States and Canada and make it a truly, truly viable business. So in April I convinced him to let me jump in, so I quit my full time job and have been focusing on this only since May of this year. So in May I was invited back kind of as alumni to the pitch night in Story for the Story store in New York City, and that night I happened to meet Adam Glassman who is the creative director for Oprah Magazine. So that night I kind of shot at my back, she’s like this is a great product, but your box – your packaging just doesn’t kind of scream what it does, and Rachel Shechtman was like, “Yeah if you want this to be in retail stores, you might want to rethink your packaging,” and all this kind of stuff. So just a great opportunity to talk to people who know the business and I did have to take a step back and do like what do I want this to look like, how do I want this to resonate in the market space if I can’t show case it on a website, how do I want this to sit on a retail shop? I took my cue from Spanx, so I loved how Spanx disrupted the hosiery market place, and I loved how bold and bright and red and colorful they were. So I took my lead from them and spent this past summer redesigning my packaging, then in June I was notified that I was going to be in the September issue of Oprah Magazine. Abby: At the time so it was June and at the time it was going to be on the show, or the September issue so it was going to be on the newsstands in August when they had asked for my price point was, and I was like this is the time to make a commitment, because it was going to be in print. So I can either go with my existing price point of 19.95 or I can go with my elevated price point of $29, and so I just on the phone I was like this is it, it’s going to be $29. And so she’s like, okay that’s what is going to go on print. I was like oh man, so I had to redo the website, I had to redo the packaging, I had to get everything set for first week of August when that issue hit the newsstands. Steve: What was the effect of the issue on sales? Steve: What was the effect of being in that magazine on sales exactly? Abby: Minimal to be quite honest. Abby: Yeah so I had – and I think because it was print, so maybe if it would have been an online article, and I was mentioned in the online article, but if it was – so I’ve also been featured in Real Simple but it was an online, it was realsimple.com not their print publication, and I’ve gotten significantly more traffic and sales from that feature than I have from being in Oprah, the print magazine. But it’s phenomenal, I mean it’s just such an honor to say that you’ve been featured in Oprah Magazine what not, but sales ironically didn’t jump too much. They jumped for sure the first week it hit the newsstands, but it wasn’t sustainable, it wasn’t a sustainable development. Steve: It has been our experience as well. Actually we were on Real Simple as well and just like a tiny little spike, but in general all the other magazines that we’ve been in also there is never like a huge spike compared to like being on TV for example. I just want to let you know that tickets for the 2017 Sellers Summit are now on sale at sellerssummit.com. Now what is the Sellers Summit? It is the conference that I hold every year that specifically targets ecommerce entrepreneurs selling physical products online. And unlike other events that focus on inspirational stories and high level BS, mine is a curriculum based conference, where you will leave with practical and actionable strategies specifically for an ecommerce business. In fact every speaker that I invite is deep in the trenches of their ecommerce business, entrepreneurs who are importing large quantities of physical goods, and not some high level guys who are overseeing their companies at 50,000 feet. The other thing I can also assure you is that the Sellers Summit will be small and intimate. Last year we cut off ticket sales at around 100 people, so this event will sell out quickly. This event caters to sellers of all levels, and if you’re a beginner, you’ll leave the Sellers summit with a product to sell, potential vendors and a road map for your business. If you’re an existing shopper, you’ll learn proven techniques to take your business to the next level whether it be through learning advanced Amazon selling tactics, SEO, social media, pay per click advertising, copy writing, email marketing, you name it. And if you are an ecommerce entrepreneur making more than $250,000 per year, we’re also offering an exclusive mastermind experience with other top sellers. So the Sellers summit is going to be held in Fort Lauderdale, Florida from May 18th to May 20th, and for more information you can go to sellersummit.com, once again that’s sellerssummit.com or just Google it, now back to the show. Abby: Right so speaking of TV, so in July, so in June I was notified I would be in Oprah Magazine and then in July I was notified that Adam Glassman had selected our products as one of six products to be featured on a special view your deal Oprah version on the view. So the view hosts these flash sales, these two day flash sales called view your deal where they offer products at a 50% discount but only for two days. That was a phenomenal opportunity that I was notified in July, so I had to get ready for that as well. So July 28 my new packaging was done, the first week of August I launched the new website, and then I was doing six orders a day like average five to six orders a day in August of this year. And then I started playing around with Facebook ads and had landed on one that was converting significantly really, really well and so I was doing 75 orders a day. Steve: Let’s back track a little bit, so the view have you gone already? Abby: So yes so I was averaging 75 orders a day in September and then the end of September I went on the view, so the view was at the end of September, it was 26th and 27th were the flash sale days, and I did 2565 orders in one day. Abby: It was insane, it was funny because my new warehouse actually they have these display monitors throughout their offices, and so they had put up my order systems on their display, so everyone in the office was like, oh my god she just hit 500 sales, oh my god she just hit 1000. They kept calling me being like do you know what you just hit, I’m like yes. Honestly I had to lay down twice that day because I thought I was going to pass out. Steve: What were the terms for being on the view, do they take like a similar percentage as HSN? Abby: No, so the view it’s interesting so they set up and I don’t know how much I can share or should share, but they set up their own Shopify site, so it’s kind of a flash sale on their terms. So I offered it at 50% offer for retail, and then they took a percentage just for keeping me on the show, and I’m not going to reveal what the percentage is. They take a percentage of kind of having me on the show. Steve: Okay but before then you had already expanded your sales 10X with Facebook ads, so let’s talk about that Facebook campaign that’s been killing it for you. What does the ad copy look like and what does the landing page look like? Abby: Sure, I don’t have a landing page; I just drive them to my home page. Steve: Well your home page is like a sales page. 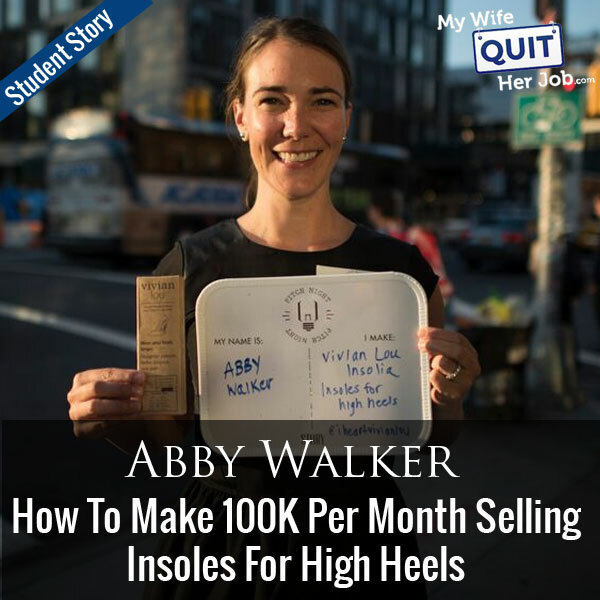 Abby: It is kind of a sales page, yes so it’s designed kind of as a sales page, but I have two ads that are converting extremely well and if you notice the – it’s the shoe graphic that I have on my home page, that kind of hero image when you first land. So it’s those pairs of shoes and then honestly underneath I just have wear high heels four times longer without pain, that’s the graphic. Then the text on top says something like love high heels but hate the pain, we have a product that will forever change the way you wear high heels, and then the headline underneath it is just Vivian Lou Insolia with shifting insoles. So it’s a very, very basic ad that happens to be converting extremely well for me. Steve: Can we talk about retargeting and what are the parameters that you use to target your ads? Abby: Sure so the only parameters I have set up for those series of ads, it has to be a woman in the United States who speaks English, who has an interest in shopping and is 38 years old or older. Steve: Interesting, so how did you come up with 38 years old or older? Abby: Based on demographics, so the gentleman from Insolia had done a demographic study, and the women who purchase my shoes tend to skew older, and I think women who buy high heels when they are younger either have more tolerance for pain or at a $29 price point they would rather put that toward a new pair of shoes versus buying an insole to put into an existing pair of shoes. Early on I tested Facebook ads skewing younger and then skewing older and the age that skews older tends to purchase significantly more than the younger age group. Steve: So are you still marketing to the younger curve or did you just turn that off? Abby: No, I turned it off all together. Steve: Okay and in terms of – like you’re saying it’s killing it, like can I just get an idea what your conversion rate is on these ads and how much you’re paying per click? Steve: It doesn’t have to be exact, like just what [inaudible 00:40:36]. Abby: Okay, let’s just say I am 6exing my daily spend. Steve: Oh in terms of — okay so you’re making 6X? Abby: Each of the profitability, so what I spend on my Facebook ads daily, I make like 6X daily. Steve: That’s awesome, and so once you found out that it was working, you just scaled it up, right? Abby: I scaled it up yup, and it’s crazy how if you raise it by $50 or lower by $50, it completely impacts and it varies, on a day it can vary 5X to 6X but that’s consistent by how much I spend a day. So if I’m running short on inventory which I did after the view, I had no idea how crazy that would take off, I ramped down my Facebook ad spend because I didn’t want more orders until I could get inventory, I didn’t want to go out of inventory and so I really scaled back. Then sure enough my orders went – I was seeing much smaller order numbers come through. One of the things that is crazy to me is that Facebook can have such a profound impact and it is so true, but I also don’t want to rest on my roles, because I know Facebook algorithms could change or whatever the case may be, it could go away tomorrow. So some of the things I’m focusing on like today is I only make five sales a day through Amazon and I’m not doing Amazon FBA and so to build my Amazon business, to also open up an amazon.ca. So I’m not even advertising to women in Canada right now which is a huge lost market. I’m in talks to open up a warehouse in a fulfillment center in Canada as well so that all of my inventory to amazon.ca, and to Canadian customers are fulfilled through Toronto. Steve: Just curious, when you’re scaling your Facebook ads, how did you know how high to scale it to, like how high did it get and why did you stop there? Abby: I’m at $500 a day averaging kind of $500 a day right now and that varies depending on what my inventory looks like. Now I will tell you I’m much higher than 6X since Friday based on Instagram ads that have taken off, and I’m still only spending $500 a day but it’s crazy. Steve: So why 500, why not like 1000? Abby: Because I don’t have confidence in my fulfillment center right now to process that many orders, so I’m in the process of looking for a new fulfillment center, one that has the capability to do very large quantities of pick, and pack orders in a single day. Steve: So I was going to ask you this also, you mentioned like your Instagram ads recently took off, do you know why that happened or do you have any idea – were you just running like ads on all the Facebook platforms and then all of a sudden Instagram took off? Abby: My initial two ads, the ones that’s been driving the majority of the traffic, when I initially set them up. I set them up to just run in the Facebook newsfeed and on Instagram, and I have not touched those ads except for ramping up and down spend since the end of September, and I have no idea why Friday these Instagram ads have taken off. So last week ironically I engaged an agency that is like a pay per click agency, and so I sent them a note this morning asking them if they could look into why all of a sudden Instagram has taken off because I had no explanation for it. Steve: And we forgot to talk about the other ad, how is the other ad different from the one we already talked about? Abby: The other ad is just one of the skews, it’s one of the red pairs of high heels that’s in the other ad, and it says something like high heels without the hurt is what it says in the copy on the ad, and then it’s just the same intro text up top, so again like love high heels? Hate pain? And then just the name of the product, and the headline down below. Steve: So it’s just a different variation of the same thing, otherwise the landing page, everything is identical? Abby: Without the ad I know. Steve: And we were talking about this before the interview recorded, but she is not doing any retargeting yet, I think you’re doing minimal email marketing right now too, right? Steve: So like there’s all these things that you can totally blow this up with which really excites me actually, like you’re just at the tip of the iceberg right now. Abby: I am, and I’m quickly becoming overwhelmed which is a phenomenal problem to have, so looking for customer service help and those sorts of things, but yes the potential for this product to kick off is huge, and I really need to focus on growing this out. I’m hoping I’ll be able to in three weeks once we figure out the fulfillment center situation. Steve: So let’s talk a little bit about, let’s [inaudible 00:46:35] the listeners a little bit, so what were some of your biggest challenges in starting your store, how did you overcome them and how hard was it for you to get started and what general advice would you give them? Abby: Oh man, the hardest part for me getting started was not knowing anything, so your course was a phenomenal help, I mean even just hearing from others who had gone through the same thing or taking and keep away from this article or keep away from that article, it’s just a tremendous help. I think my one tip I have is don’t be afraid to admit that you don’t know anything and rely on folks who do know what they’re doing. It was a huge learning process and still is for me, I dove in not knowing much about HTML, but learning it quickly to try and get my photos to become the right size on a Shopify platform to asking help in understanding a contract when it comes to either your fulfillment center or becoming an exclusive distributor. There was just so much to learn, but I loved that part of it, so while it was a challenge, it was also really rewarding that I admitted that I didn’t know what I was doing but I was okay with that and I wasn’t shy to ask a lot of questions. Steve: Then you decided to go to New York to join this group and that got you an Oprah and the view and HSN. Steve: And fulfillment houses you went out and you just got one who was willing to work with you despite the small quantities. I mean that’s – what it really comes down to is doing the leg work and willing to do the work, right? Steve: I thought it was great, you remember this conversation, I thought it was great. Abby: Yeah I do, I do and you were like don’t change it, it looks great, people know what they’re getting. But yeah so don’t compare your beginning to someone else’s middle and that I think is critical, and it’s all journey and I’m so thankful, so incredibly thankful for all the people who have given me this opportunity and given me their time to share their wisdom on how to move forward. Steve: That’s awesome Abby, well you know I really appreciate you coming on the show, I think your story is really inspirational, I think the listeners will get a whole lot out of it. Steve: Thanks again Abby, oh and I always end, so where can people find your products, I didn’t spell your URL? Abby: On my website at vivianlou.com, V-I-V-I-A-N-L-O-U.C-O-M.
Steve: Yes and anyone who has heel pain or high heel pain should definitely go check it out, I will be getting a set for my wife for sure. Steve: Thanks a lot for coming on Abby, take care. Steve: Hope you enjoyed that episode. As you can probably tell Abby is an amazingly driven woman and her success is a direct result of her hard work and tenacity, so congrats Abby. For more information about this episode, go to mywifequitherjob.com/episode150. Once again I want to thank klaviyo.com for sponsoring this episode. Klaviyo is my email marketing platform of choice for ecommerce merchants, and you can easily put together automated flows like an abandoned cart sequence, a post purchase flow, a win back campaign, basically all of these sequences that will make you money on auto pilot. So head on over to mywifequitherjob.com/Klaviyo, that’s K-L-A-V-I-Y-O, and once again that’s mywifequitherjob.com/Klaviyo. I also want to thank privy.com for sponsoring this episode. Now Privy is the email capture provider that I personally use to turn visitors into email subscribers, therefore email capture, exit intent, and site targeting tools to make it supper simple as well. I like Privy because it is so powerful and you can basically trigger custom pop ups for any primer that is closely tied to your ecommerce store. So if you want to give it a try it’s free, so head on over to privy.com/steve. Once again that’s privy.com/steve. Hi… You seem to have a good understanding about it. When I enterd your blog, I felt this. Come on and keep writing your blog will be more attractive. To Your Success! Abby – loved hearing your story! I will be buying your insoles ASAP! Cheers you your success! Just started listening to your podcasts, Steve, and I want to thank you and Abby for a very inspiring interview and story! I have one question. I was wondering why Abby doesn’t use Amazon as a fulfillment center. I sell my jewelry and photography/art on Handmade at Amazon and their FBA warehouses work quite well for me. I’ve heard that they can act as a fulfillment center for products sold outside of Amazon as well. I look forward to listening to more of your podcasts…it’s my favorite thing to do while I make jewelry! Steve asked great questions that were so relevant to his audience. Thank you STeve and Abby. What I didn’t understand was when did Abby do your course? I don’t think she mentioned when she picked up the course in her journey? Thank you.